Hey All, my name is Marcus Fitts and fell in love with this Triathlon Lifestyle in 2015! Being a collegiate swimmer and runner it was hard to let go of competition upon my release into the “real world” so I began searching for a new challenge and way to stay active. Nations Triathlon, in 2015, would be my first race after getting bored with running races and was instantly hooked. Entering transition of my first race, I immediately noticed a dearth of diversity in the sport. Coming from a swimming, track and coaching background, I was not surprised and realized this needed to change. 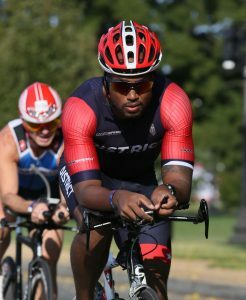 So I started District Triathlon,a 501(c)(3) organization working to encourage, inspire, support and increase the participation of People of Color in triathlon and endurance sports, promote healthy lifestyles and uplift communities in DC and the Washington metropolitan area. With the help of this newly found community I’ve completed over 30 triathlons and introduced 40+ first time triathletes to the sport. I look forward to welcome more first timers as a Kinetic Multisport Ambassador!